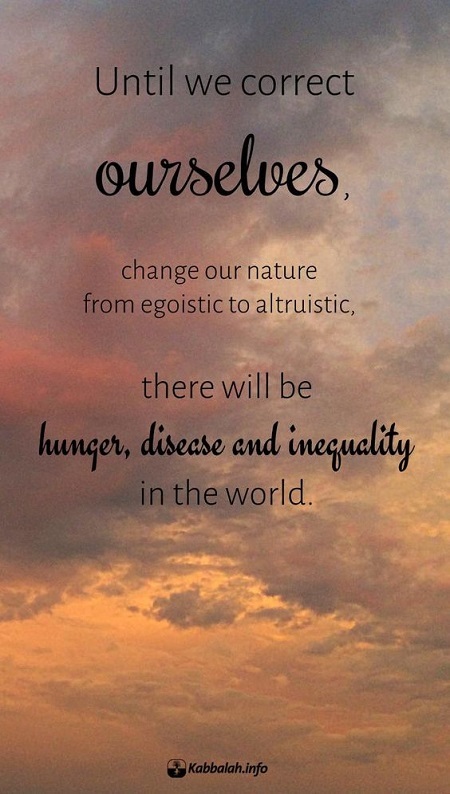 Until we correct ourselves, change our nature from egoistic to altruistic, there will be hunger, disease and inequality in the world. Today, Nature forces us to gain love for our neighbors since the only alternative to it is death from hunger, disease, and cataclysms. It’s our duty to form an alternate force that would oblige us to move towards mutual love. What kind of force is that? It is our surroundings that are organized in a way that pushes us to unite even more than ecology, economics, education, possible lack of food supply do. Society must be strong enough to sustain our egoistic nature, impose a new type of relations among us, and thus lead us from one edge to another—from hatred to love.